An Explosion of Colour, Energy and Music! "The warmth and enthusiastic rapport with the audience, combined with the infectious rhythms and dazzling dance created and evening of unsurpassed enjoyment!" Aché Brasil represents the culture, the traditions, the beliefs, the music and the movement of the people of Brazil. 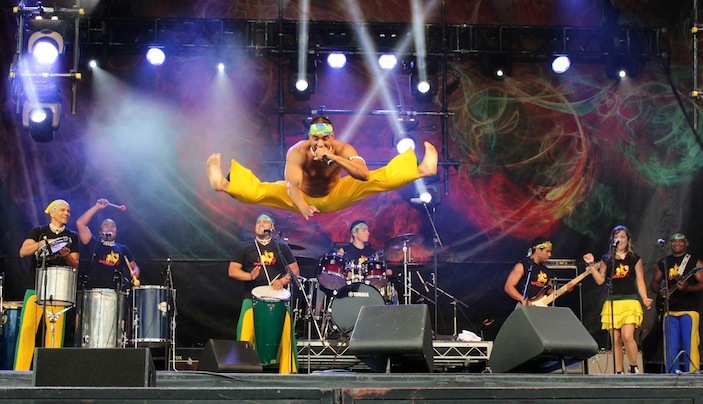 Equal parts dance, music, spectacle, Aché Brasil has played to enthusiastic audiences and critical acclaim from all over North America receiving a nomination for "Live Performers of the Year" at the West Coast Music Awards. 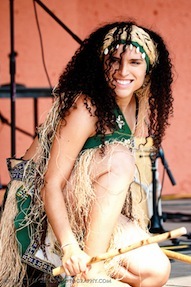 Aché Brasil specializes in the performance of popular and traditional Afro-Brazilian music, dance and rhythms. 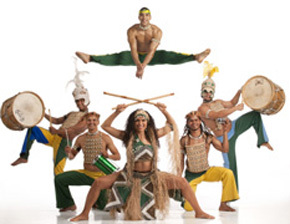 Amazing acrobatic feats and dances all done to a combination of Brazil’s most infectious rhythms, featuring a fabulous back-up band comprised of some of Brazil’s and Canada’s finest musicians. While Aché Brasil’s music is rooted in the more traditional forms of Brazilian rhythms: Samba, Maracatu, Coco de Roda, Capoeira; it also reflects the influences of Brazilian and North American pop. These influences have created something new, Aché Brasil’s own contribution to the evolution of Brazilian music. Originating from Pernambuco, by founder and director, Mestre Eclilson de Jesus, the group has gone on to receive international acclaim, performing in thousands of festivals and special events including 19 shows for the 2010 Olympic Games Celebration Sites; Jazz and Folk Festivals, Toronto’s Harbourfront Centre; as well as many television programs such as, On The Road Again - CBC; Anti-Racism Campaign - Much Music; Knowledge Network - Learning channel, and more. "Thank you for making this year's West Coast Music Awards a huge success. Aché Brasil's performance was spectacular... the highlights of the evening!" Known as Camara, Sam has studied with Mestre Eclilson de Jesus since 1997, receiving his “formado” in 2005. He has trained as a singer, dancer, actor and musician and is known for his multi-talent and his outstanding voice. A dynamic performer and capoeira teacher, he started performing with Aché Brasil in 2000. Recently Camara travelled to China with Mestre Eclilson, where he was featured on the Cover of a Fitness Magazine distributed all over China. Daniel Zilsel - Capoeirista, Dancer, Percussionist. Born in Vancouver, Canada, Daniel began training Capoeira in his childhood. After moving to the Island, Daniel moved back to Vancouver to begin his formal training of capoeira and music under Mestre Eclilson de Jesus. Due to his amazing acrobatic skills, he soon began to perform with Aché Brasil. Since then, he has travelled to Brazil numerous times to upgrade in capoeira and Brazilian music. He now speaks fluently Brazilian Portuguese and is very familiar with the Brazilian culture. He is well known for his breathtaking acrobatics and has worked as a performer and a teacher at Aché Brasil for many years. Fernanda begin performing in Brazil at the age of 10. She grew up dancing and performing with the dream to move to Canada to be part of Aché Brasil, her uncle’s music group. She moved to Vancouver, Canada in 2000 and began performing with the group the next day she arrive. She took many workshops of traditional dances in Brazil and is now a performer, choreographer and a dance teacher.